I am so happy and super excited to be part of Creative Design Team for Graciellie Designs. It is indeed a privilege to be part of Graciellie Design team. Graciellie Designs has a an amazing collection of digi stamps paired with wonderful sentiments. They also have beautiful digital pattern papers. 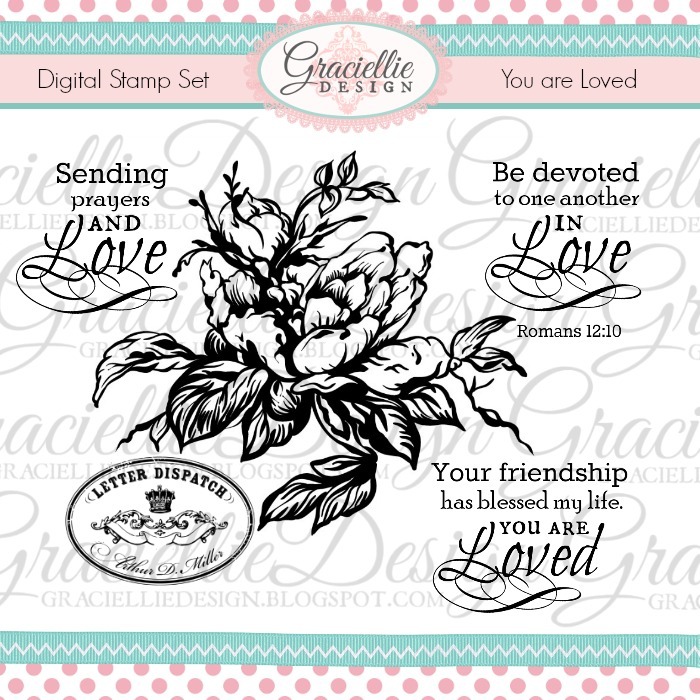 Gracie Chavez also designs for Sweet N' Sassy stamps. Today I want to share my card using the latest stamp release - 'You are Loved'. I took a print out of the stamp (on a laser printer) and colored it with Zig color pens. I layered it again with another print out for a 3D effect. I took a white card stock and added an embossed panel. I added a offset circular die cut and mounted the colored images with foam tape. I printed the sentiment on to a white card stock and inked it with Mowed Lawn DI. Finished off my card with few yellow enamel dots. Here are few more pics. Thank you for stopping by. Hope you liked my card. Do check out other design team member's inspiration with the February release. Participate in the blog hop and leave comments too. You stand a chance to win $13 gift card. Love your card design and the beautiful yellow flower. Awesome coloring. You make it look so east for the 3-D effect. I am going to try it now. Thank you. Beautiful work. WOW! Awesome card love the yellow! So very pretty!!! Thanks for the inspiration! I luv roses.....so pretty! Thanks! What a wonderful card. The colors are spectacular. Thanks fo rsharing. A yellow flower so perfect for a card for a friend a yellow flower is so perfect for a card for a friend. I really like what you created and looK forward to more of your work. LOVE the beautiful, vivid colors you used! Such a gorgeous and elegant card!! Very pretty in yellow. I like the dimension. Love how vibrant your colors on the flower. Stunning card. Beautiful coloring, love the yellows. This is such a beautiful, striking card! Love it so much. So glad to have you on this blog hop! Simply beautiful, I love your coloring!! Congratulations!.. Lovely card..was not interested in digi images as don't have printer n don't have idea which paper n how to use it..if you share..it will be a help.as I use water color paper for coloring..is it possible to print on that? Thank you Daksha. For digi stamps, You have to use a lasejet printer. You can ask a local printer to print it for you. I have used Bielo CS. Water color 300gsm will not print well but upto 200 gsm can be printed. Oh my, my jaw dropped to the ground. Your colouring is absolutely perfect. I love the black contrast, and colouring in yellow is so perfect. Beautiful card and beautiful flower!